Firefly Projects as viewed towards the east, above the interchange between the unnamed expressway to Broker Bridge and the Broker-Dukes Expressway. Firefly Projects is a large housing project in southeastern Broker. It is bordered to the north by Deadwood Street and to the northwest by Onondaga Avenue (South Slopes); to the west also by Onondaga Avenue (Hove Beach); to the south by Crockett Avenue (Beachgate); and to the east by the Broker-Dukes Expressway and an unnamed body of water. The population of Firefly Projects is mainly African-American, and the neighborhood also serves as the center of operations for the African Americans. Aside its extensive apartment/projects complex, Firefly Projects also houses a train yard that branches off the Broker Line. The district bear similarities to Ocean Hill and Brownsville in Brooklyn. 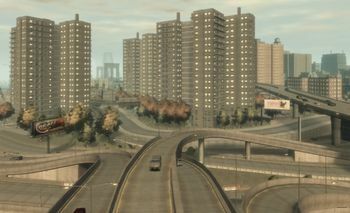 The Liberty City Subway does not serve the area; however, residents in the southern and western areas may choose to use Hove Beach station in its namesake neighborhood, while those in the northern and eastern blocks might find it more convenient to head north to South Slopes for Schottler station. Firefly Projects is notable for its glitch-laden swingsets, capable of flinging, at great heights and distances, vehicles that push against them. While there are four such swings in the area, only two are situated in an area that has ample room for players to drive in with a moderate-sized vehicle. The swingsets are also known to hit and fling players in contact with the swing through the same process. ↑ GTA IV "Swing Glitch" on Youtube. This page was last modified on 27 April 2012, at 13:44.